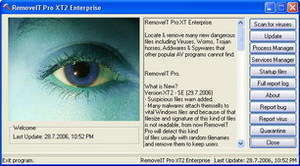 RemoveIt Pro is the little brother to the non-free RemoveIt Pro Enterprise Edition and like the paid version, RemoveIt Pro is able to find and remove malware which are sometimes not found by competing antivirus programs. Version 31.8.2015 is a freeware program which does not have restrictions and it's free so it doesn't cost anything. For security reasons, you should also check out the RemoveIT Pro SE download at LO4D.com which includes virus and malware tests. Additional screenshots of this application download may be available, too.